I made these a while ago but never got around to making a post about it. 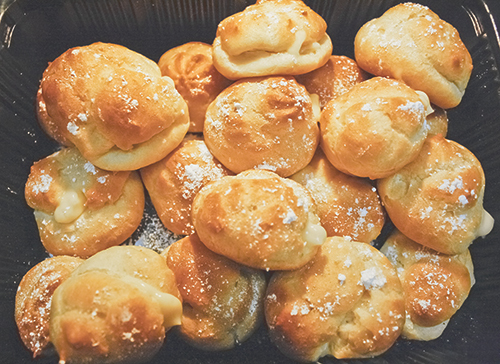 I thought I would share with you this recipe for cream puffs I found over at steamykitchen. It’s a super simple recipe that even a monkey could follow. The filling is Jell-o’s vanilla pudding instant mix, and I sprinkled powdered sugar over the cream puffs. I wanted to test out a pipping utensil I bought at Daiso, which I totally recommend for piping in fillings for cream puffs even if can get a bit messy when putting in the mix into the container.